The resistor is a passive two-terminal electrical component that implements electrical resistance as a circuit element. where 'I' is the current through the conductor in units of amperes, V is the potential difference measured across the conductor in units of volts, and R is the resistance of the conductor in units of ohms. The Resistor is a common element of electrical networks and electronic circuits required for developing any embedded system. The resistor is made of various compounds and films, as well as resistance wire (wire made of a high-resistivity alloy, such as nickel-chrome). The resistors are also implemented within integrated circuits, particularly analog devices, and can also be integrated into hybrid and printed circuits. The electrical functionality of a resistor is specified by its resistance. 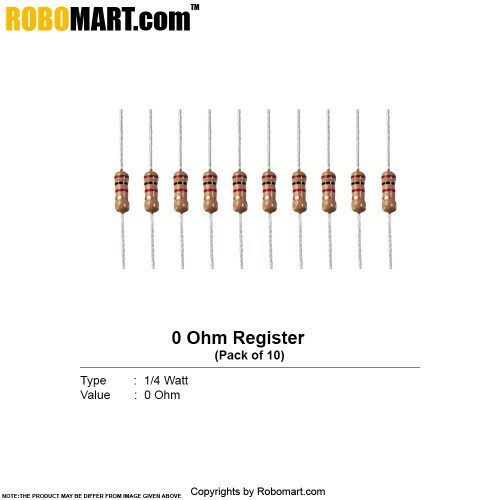 The resistor is a two terminal device making it very handy while applying it in series circuit or parallel circuit. In Series Circuit, the resistance will behave as a Voltage divider. The Application of this technique is very vast as some distinct values of potentials are required while developing any Embedded System. The voltage divider Circuit provides two different values of potential across the resistors. In Parallel Circuit, the resistance network will behave as a Current Divider. The current flowing through the circuit divides. The branches will allow flowing of differential amount of current in each branch depending on the amount of resistances connected. - RC Oscillation Circuit: Resistance is a necessary part of RC Oscillation Circuit. More the resistance, higher will be the Time period of oscillation. Connecting the resistance in series will provide very nice and smooth change in Time Period.